I am a huge fan of science-fiction movies like Inception, Matrix, Interstellar, The Mist and even Stranger Things. They all have something in common: there’s some kind of a parallel reality or a dream that the protagonist finds themselves in. If we compare this to pedalboards and signal paths, the routing is often in serial, meaning instrument into pedal into pedal into pedal into amp. Done. Sometimes there are mix controls on the pedals to balance the dry level or the ”original“ signal. But what if we want to use the pedals in parallel? For example 2 pedals get the same signal and the output is then merged? It can open the sound in new ways and create way more width than a signal processed in serial. Sure, effects like modulation, delay or reverb are often mixed with the original dry signal, otherwise it will get too ”wet”. But have you ever tried using overdrive pedals in parallel? Having overdrives in parallel is often a very good choice. In studios this is a common way of layering different amps, pedals, etc. and balancing these signals until they complement each other perfectly. Overdrive pedals in parallel can’t influence each other – they just add. Having a green screamer and maybe a warm bluesy overdrive in parallel can complement each other very well and deliver a full, saturated and wide experience. If you are adventurous and ready to leave more common paths, here are a few ideas for you to try! 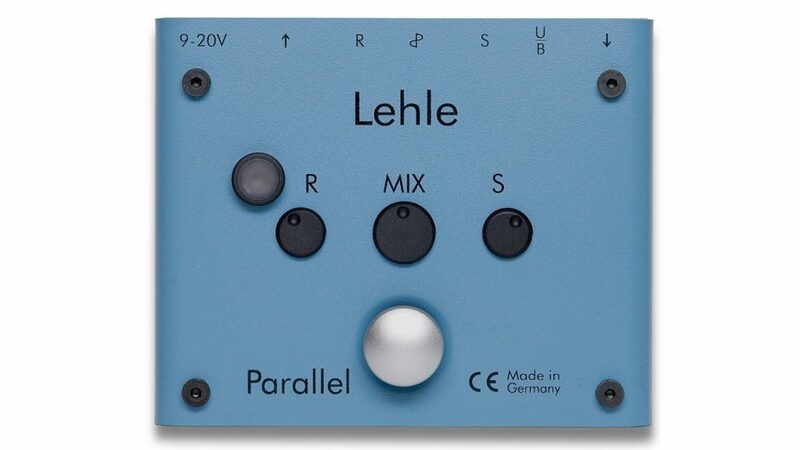 The signal is split via the LEHLE MONO VOLUME’s direct out and volume out. After processing the 2 overdrive pedals, the signal is then merged back together via the LEHLE PARALLEL L’s input and return, which acts as a simple ”2-channel-mixer”. If you deactivate the PARALLEL L the input goes straight through, so only one overdrive will be heard. If you change the volume via the MONO VOLUME, you can change the amount of overdrive 2 via your foot. A little bit more gain for the solo? Use the boost of the MONO VOLUME to add up to +10 dB for driving the overdrive more. If you own a LEHLE JULIAN or any other EQ pedal, place it before overdrive 1. Pushing or cutting different frequencies will give you a completely new pedal. The advantage of placing the EQ stage before and not after the pedal is, that the gain structure will react differently and the harmonics are often way more ”beautiful” and interesting than having the EQ after the overdrive. Do you need to attract attention for your solo, but have no more headroom for increasing volume anymore? Push the mids on your EQ so your overdrive 1 sounds obnoxious on it’s own, but in combination with overdrive 2 it cuts through the mix without additional volume. More info about linear boosts? Read the post about absolutely neutral and linear boosters here. You like how your overdrives interact? Great! But sometimes you can’t decide if parallel or serial is better? Do both! 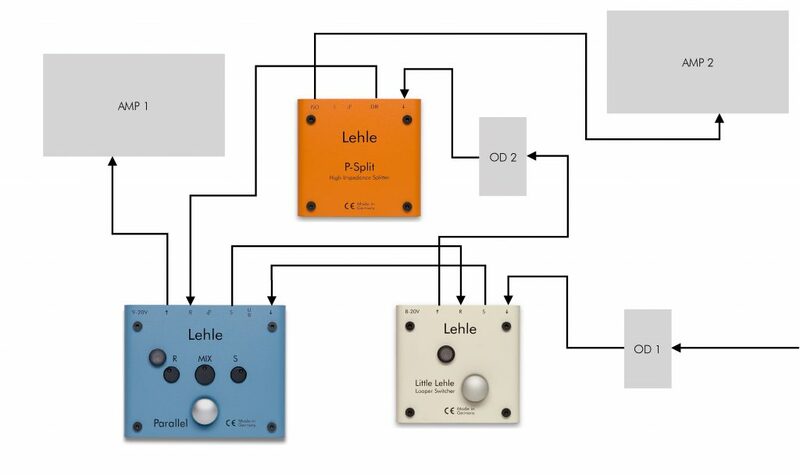 Here’s the overdrive 2 placed in the parallel loop of the PARALLEL L. Depending on the setting of the MIX and SEND knob at the LEHLE it gets more or less of overdrive 1, so it’s a typical ”gain staging“ scenario, but you will also hear the original sound of overdrive 1. I know – modulation effects usually have to be placed after overdrive pedals or in the effects loop of the amp. But since we are experimenting I really recommend placing a vibrato, tremolo, phaser or chorus before an overdrive. Of course it’s a matter of taste, but you can get really interesting results. Depending on the gain setting of the overdrive, the dynamics that the modulation pedal creates often influences the gain stage of the overdrive in a beautiful way. 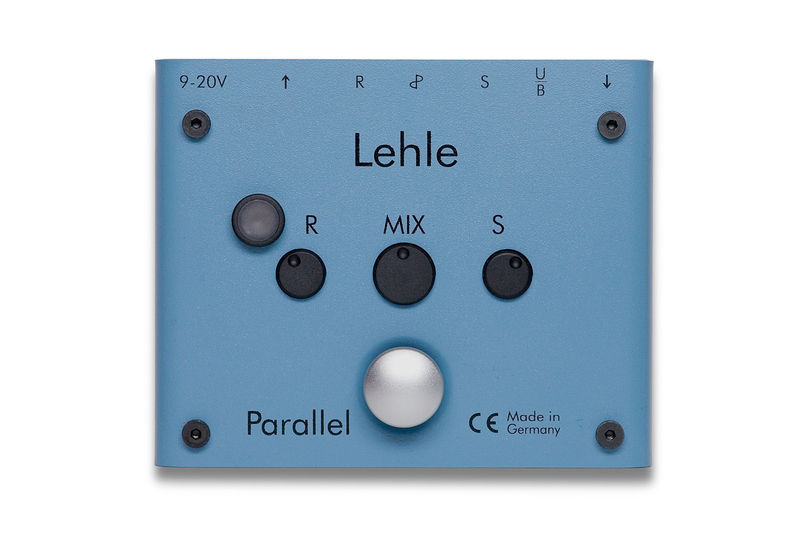 Carefully dial in the mix amount of the LEHLE PARALLEL to create a second layer. You can then blend-in your guitar signal almost without it being audible. Your sound will get more depth without losing the clarity or transients of the original sound. The last setup is a little bit more advanced and not so obvious at first sight. Basically it combines two amplifiers and a combination of serial and semi parallel signal routing which opens even more possibilities. The signal of overdrive 1 is sent into the LITTLE LEHLE II. 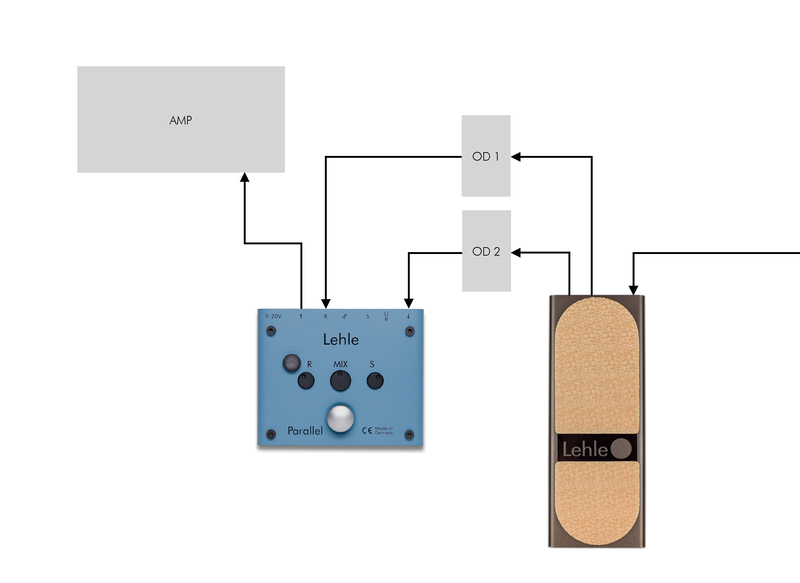 If the LEHLE is deactivated it sends out the signal to the overdrive 2. 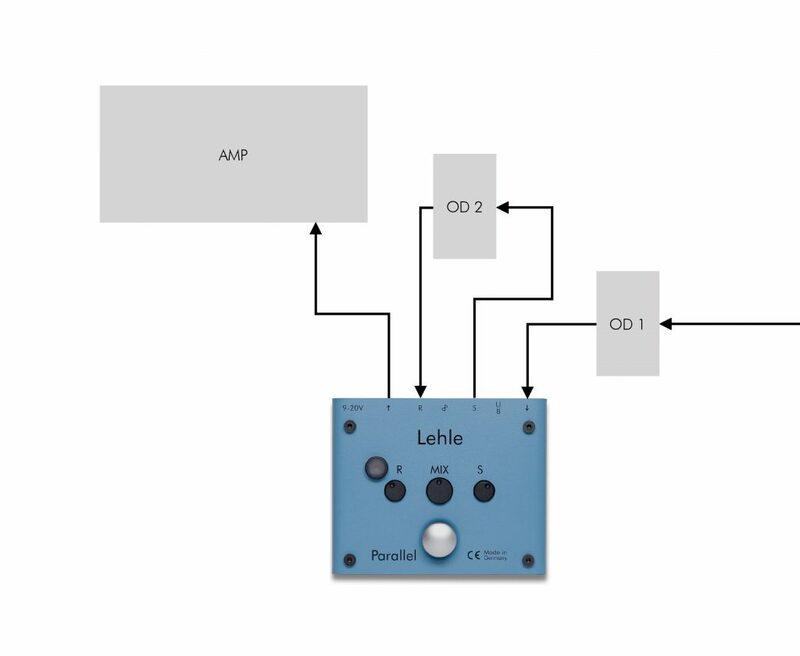 Then the signal is being split via a LEHLE P-SPLIT II while one signal goes to amp 2 and one to the return of the PARALLEL L and then to the amp 1. 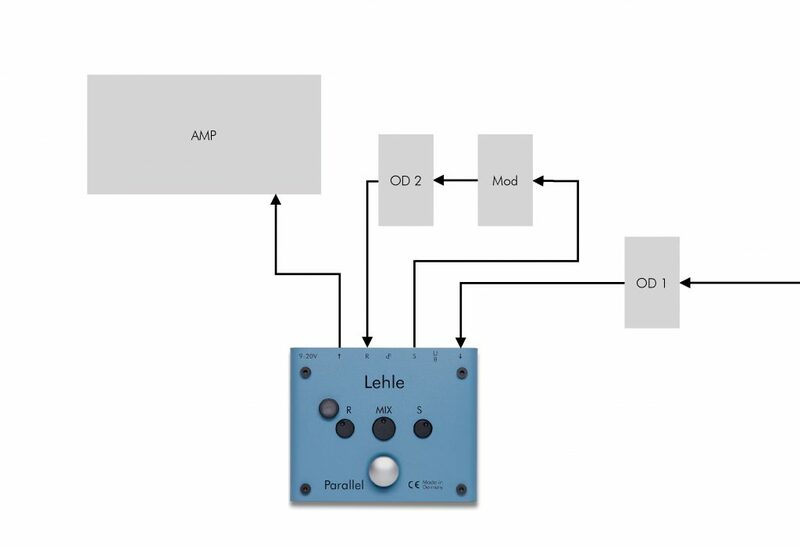 If the LITTLE LEHLE II is activated, it sends out the signal to PARALLEL L, which sends out e.g. 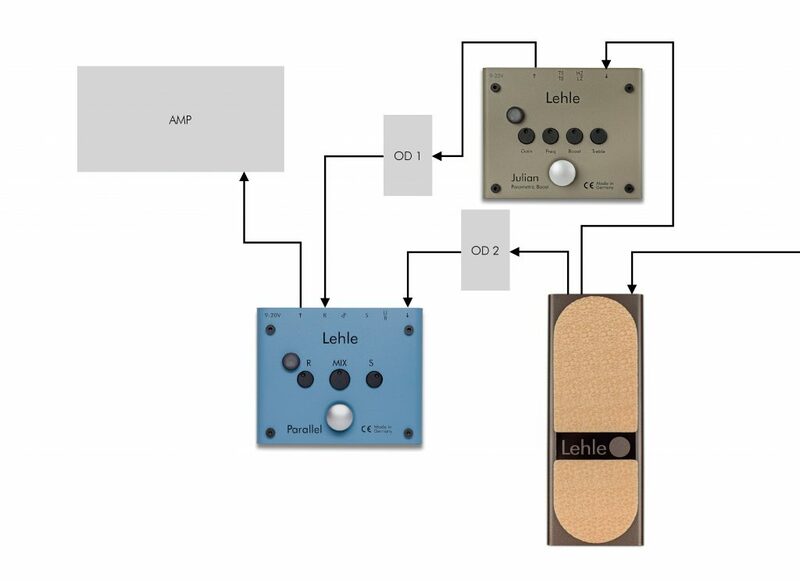 50% back to the return of the LITTLE LEHLE II and then to the overdrive 2. So overdrive 2 is still getting the signal of overdrive 1, but a little less. Back at the PARALLEL L the signal of overdrive 1 and 2 are getting mixed and then go to the amp 1. Amp 2 gets a different signal than amp 1, so they are again complementing each other. Also depending on which overdrive is activated and which LEHLE is currently active there are lots of possibilities to get different results. – Most fuzz pedals don’t like buffered sounds or buffering at all, because this is what you are doing when splitting a signal actively. They like to interact with the pickups directly, but there’s a small chance you like the result of a parallel fuzz pedal. So give it a try! – Start with low gain settings. Since you’re layering different gain stages the result can be very fast very loud and screaming. Be careful! – Phasing problems? Some pedals flip the phase when activated. This is a known issue. At the PARALLEL L you have a phase switch to flip the phase of 180° so the sound shouldn’t sound hollow. – Need more advice? Send me a message to support@lehle.com and we’ll figure it out.